Life On The Hill Church will be sending a group of people to Thailand and Myanmar to visit Sowers International, one of our missionary partners! We will be supporting our House Of Refuge that we are funding for the at risk youth in the area as well as partnering with Sowers in their discipleship and evangelism work. This is an exciting opportunity for our congregation to be involved with and to learn more about the work God is doing outside of our church walls! For more information about participating, please click below. Join us for our Good Friday service where we will be examining Jesus’ amazing sacrifice and the hours leading up to this momentous event. Please join us for our regularly scheduled All Church Luncheon where we will enjoy food and fellowship with our church family! We invite you to join us for our monthly worship music event where we will engage in a corporate time of singing, prayer, and meditation! Our focus will be on worshipping Jesus and giving all glory and honor to Him! This discipleship group, led by Rob Orr, will explore basic truths found in the Word about Heaven. Through Rob’s leadership, this group, aimed at adult men and women, will be exploring more about our future home as Christians in all its glorious wonder. The group will meet weekly for a period of 12-14 weeks on Monday evenings at Life On The HIll Church. You do not want to miss this exciting learning opportunity! 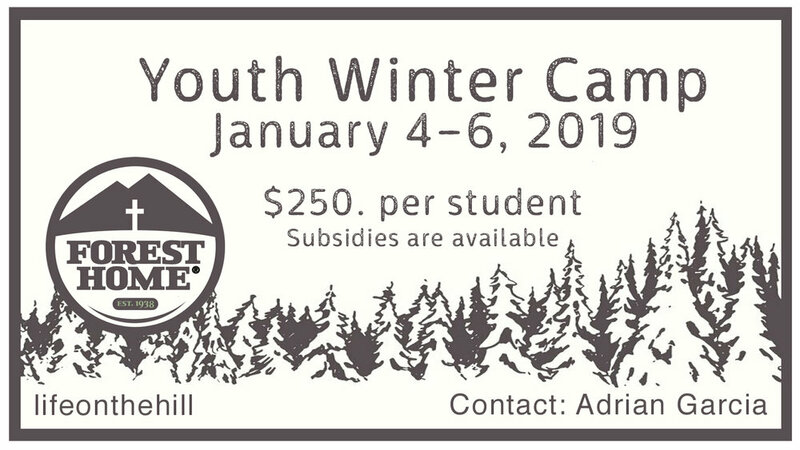 Youth Winter Camp is coming in January 2019! Aimed at middle school and high school aged youth, this is an incredible opportunity to hear the Gospel of Jesus Christ, explore the Word of God, pursue God’s call, engage in Christ-centered relationships, and connect with God through His creation. The cost is $250/student, but please do not let cost be a barrier as subsidies are available! Space is limited, so please contact Adrian Garcia to sign up. Thank you for your interest! You will contacted shortly with more information. We invite you to join us for our last All Church Luncheon of the year where we get to fellowship together over food as we celebrate the Christmas season together! We will also get updates about the exciting work God is doing in and through our church! Join us as we celebrate this festive Christmas parade with our neighbors! The parade route is along Silver Spur Road and will pass right by Life On The Hill Church. We will be meeting at church beforehand to prepare hot chocolate and other Christmas goodies to pass out during the parade. We will also have food for our church members and volunteers who wish to attend. To sign up, please click on the link below. Hope to see you all there! Thank you! See you on 12/1 at 4 PM! You may want to arrive a little early as parking around church will be shutting down at 4 PM.